The party's general secretary Rohana Lakshman Piyadasa said yesterday (21) that the party should never allow the dream of a certain international community that is expected to create violence in the country. At the same time, he asked the Independent Party supporters and the public not to engage in violent and riot in any case, going to peace and justice. When the Speaker announced that the UNP had a majority in four minutes when the parliament was first formed under the new government on 14th, he questioned the backing of the foreign ambassadors gathered in parliament and stood up for applause. The police were brought to parliament. He pointed out that this is the first time in the history of Sri Lanka parliament. 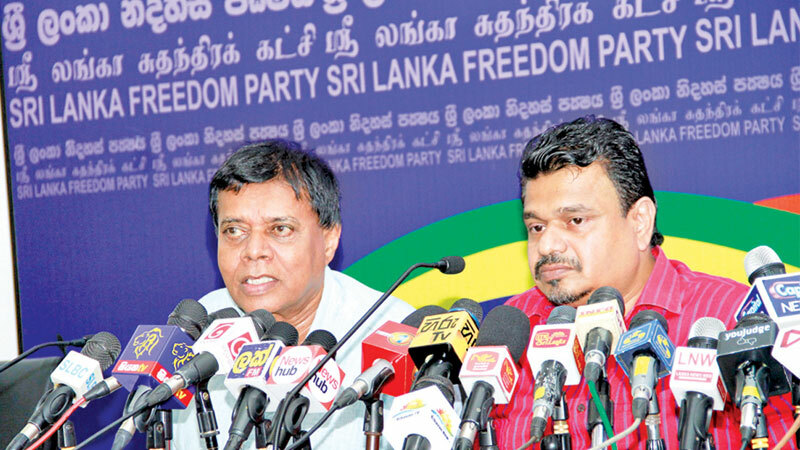 He said at a press conference held yesterday afternoon at the Freedom Party office in Darley Street, Colombo. "The last few days in Parliament, the disturbance due to the Parliament over the hope down to the public. This is a very worrying phenomenon. These actions contributed to the capanayakare. His post and forget the party on behalf of the defunct All the confusion caused. Speaker's background International acting as elected he PTI. The Speaker carried out his activities without following Parliamentary Standing Ordinance. But he said that the non-confidence motion against former ministers Rajitha Senaratne and Ravi Karunanayake in the last government has been able to understand the biased activities of the speaker since he did not come to the order book for several months. In the meanwhile, Veerakumara Dissanayake MP, who participated in the press conference, said that the Speaker, who had to protect 225 MPs, defended the UNP only by defending his neutrality. He prostheses his post. He realized his mistake and said that the Speaker's resignation would be appropriate for this meeting. Referring to the UNP's support to Ranil Wickremesinghe, MPs said that all the MPs were supporting Prime Minister Mahinda Rajapaksa. 2.0 in Tamilrockers: Do you know the technology used by the Tamil film Release?